Civic engagement is at an all-time high. But this flurry of activity begs the question: Are people effectively reaching their member of Congress? Perhaps the best thing to come out of the 2016 Election is the mobilization of huge numbers of constituents motivated to demand that their elected officials actually listen to them. Civic engagement is at an all-time high. Congressional offices have been flooded with faxes, emails, and phone calls. But this flurry of activity begs the question: How do I make sure that I'm effectively reaching my member of Congress? First step: find out who represents you. While you can search by your zip code on House.gov or Senate.gov, Common Cause has a handy website where you can put in your address and find the names and contact info for all of your federal representatives. After Election Day 2016, a former Congressional staff member to two Republican members of Congress posted a series of tweets as an instructive guide to effectively engaging with elected officials. For the most part, Emily Ellsworth’s tweets are spot-on, particularly her advice to call your member’s office instead of emailing, writing letters, or faxing. While members vary in how they approach constituent mail, phone calls are always going to be your best bet: Members receive thousands of emails and letters a week, and will often group them together for form responses. When calling, you will reach a live person – typically a staffer – who will take down your comments and tally responses for the member. My own experience working for five years on the staff of a Democratic member of Congress began in the summer of 2009 – at the very height of the health care debate – right before the passage of the Affordable Care Act (ACA). On certain days, those opposed to the ACA would be instructed to flood Congressional office phones, and all ten staffers in our district office would be engaged with constituents, tying up phone lines and making our other daily work difficult for at least 2 hours as the phone-storm raged on. While the phone calls did not change my boss’s mind on the ACA debate, it put our office on notice – and led to the first close race my boss had had in 10 years, with the midterm election of 2010. Phone calls to your Representative and Senators are key to making your voice heard in holding elected officials accountable to those they represent…but must be followed up with real mobilization and action leading up to your elected officials’ next election. Head over to your elected official’s legislative webpage to find their offices in the area. If you know the name of your representatives, it’s fairly easy to pull up their webpages: Members in the House of Representatives have webpages that follow the rubric lastname.house.gov, and Senators’ websites can be found at lastname.senate.gov. BONUS: There is a strict division between what Members of Congress’ legislative offices do and what their campaign offices do (federal election laws prohibit legislative offices from engaging in electioneering, and campaign offices cannot speak to legislative policy). However, be sure to call the legislative offices (both in district and in DC), and if you have extra time, call the campaign office to let them know that if the member does not vote or speak out on issues that matter to you, s/he will not be getting your vote in the next election. If you have donated money to the campaign in the past and are not satisfied with your member’s stance, let the campaign know that you do not plan to donate again, and that you will dissuade other donors from further funding the campaign. In order to balance their voting and legislative duties in DC, as well as their representative duties in district, most members of Congress follow a schedule of being in DC when Congress is in session (typically in DC Monday through Thursday), and heading back to their districts when voting is done for the week (typically Friday through Sunday). But members of Congress rarely have weekends to themselves, as their schedules in-district are packed with things like constituent meetings, visiting local businesses, and attending in-district events. Many will pre-schedule and hold town hall meetings, where constituents can come and ask questions and receive updates. MSNBC has reported that those opposing President Trump’s recent actions have been showing up to town hall and public meetings to take their members to task on supporting or abstaining on key issues, with progressive activism putting growing pressure on members – some of whom have cancelled or fled their recent public meetings as a result. There is a handy guide being compiled in real time with the latest town hall and public meeting schedules for members of Congress around the country. Attend these meetings whenever you can and respectfully bring your issues to the attention of your member. If your member of Congress is not included on this list, you can search their legislative website for upcoming public events, and if your member has none scheduled, you can call and urge them to hold one to address constituent concerns. In her Twitter thread, Emily Ellsworth suggested engaging on social media was ineffective, but I disagree. 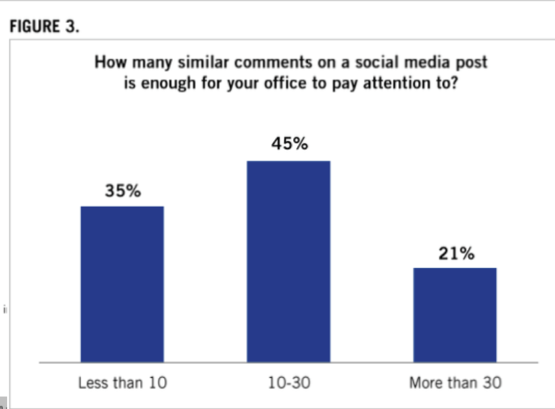 In fact, a report from the Congressional Management Foundation about how social media influences members of Congress and their staffs detail just how much weight Congressional offices give social media. Again, social media usage varies from member to member. Some (like Sen. Cory Booker in NJ) actively and personally engage on platforms like Twitter, while others allow a staff person to run the account for them (with approval of all messaging). In either case, staff will often remove comments that are verbally abusive or seen as harassing towards the member. But well-thought out points made in opposition to a member can work to your advantage in two ways: 1) those who follow the member on Facebook or Twitter will see your thoughts and perhaps find persuadable arguments in them, and 2) if your comment or tweet is reasonable and it is taken down for simply disagreeing with your Representative, the move could backfire on the member (just make sure you take a screenshot of your comment or Tweet so that you have record of it). There is nothing that members hate more than negative press, whether local or national. Most Congressional offices will clip and save stories featuring, quoting, or mentioning the member, on either a daily or weekly basis. For those crunched for time, social entrepreneurs have created some fantastic post-Election tools and resources for effective civic engagement. Indivisible Guide was created by former Congressional staffers, and provides resources on how to most effectively engage with Congressional offices. Their website includes local groups and events in your area, and they regularly hold phone calls on major policy and issue areas to help inform those who want to get involved. Daily Action sends you quick text alerts every morning, telling you the issue of the day, and who (and how) to contact to voice your opinion. The Sixty-Five is a group of folks who come together with a weekly call to action on the issue are of the week, and has a running list of elected officials, issue areas, and scripts available on each particular issue. Once you enter in your state and your district, a script for the week will pop up alongside the phone numbers of your Senators and Representative. And finally, Echo Through the Fog has a great guide to calling your elected officials when you suffer from social anxiety – an important reminder that while phone calls are most effective, not everyone feels comfortable making them. How have you reached out to your legislators lately? Tweet to us @rethink_media and let us know!